The Ariane 5 rocket is a heavy lift launcher used to launch commercial satellites and ESA science projects into space. Using a limited number of engines, Ariane 5 has a simple yet robust architecture. The vehicle consists of a main cryogenic core stage, two solid booster stages, and an upper stage. Thirty meters tall, the MCS operates on non-toxic cryogenic propellant for just under 600 sec. Its engine is ignited seven seconds before liftoff, allowing full monitoring during startup and thrust stabilization. Taller than the MCS, the two solid boosters deliver more than 90 percent of the total launcher's thrust following liftoff. The SPS - Ariane 5's first upper stage - propels the launcher's payload to its final orbit and provides an accurate orbital injection. Arianespace, which assembles the rockets, has developed a full range of payload adapters, fairings, and dispensers to accommodate all kinds of payloads. Sylda 5 enables dual-payload missions, accommodating satellites with a maximum height of 2.9 to 4.4 meters. Speltra, also for dual-payload missions, carries satellites up to 6.1 meters tall. The ASAP platform carries mini- or micro- satellites as secondary payloads. The exceptionally large payload fairings enable Ariane 5 to launch all satellites currently in service (as well as those in development). Ariane 1 first flew December 1979, and the eleven Ariane 1 flights successfully placed 14 payloads into geostationary orbits. Its payload capacity was 1800 kg. By January 1982, when Ariane 1 had flown only four times, the next three programmes had already been approved by the ESA. Ariane 3 first flew August 1984 with 150% more payload capacity than Ariane 1, a larger third stage and payload fairing, and two strap-on solid propellant boosters. Ariane 3 also flew eleven times, putting five more payloads into orbit than Ariane 1 did. Ariane 2 had the same launch configuration as its predecessor, though lacking the strap-on boosters. It first flew May 1986, yet it only launched six times and unloaded a total of five payloads, with a payload capability reduced by 5000 kg from its predecessor. When the Ariane 4 was created, six versions of the launcher were available. Its updated core launcher could be equipped with solid, liquid, or mixed strap-on boosters. Its payload capability, 100 kg more than twice its predecessor's, Ariane 4 first flew June 1988. When it finally retired February 2003, Ariane 4 flew 116 missions, delivering 182 payloads to outer space. The next version, Ariane 5, launches dual combinations (e.g. telecommunication satellites), though with a payload capacity enabling payload launch of any weight or size. It also follows in the Ariane 4 footsteps as a cost-efficient commercial payload-launching machine. On July 4, 1996, its maiden voyage ended in failure attributed to computer error. However an Ariane 5 rocket successfully launched the Rosetta probe on March 2, 2004. Ariane 5 is the current launch vehicle and is expected to remain in use until at least 2015. The Ariane launch facilities are known as the ELA. The first ELA was built for the Europa vehicle and then used for Ariane 1, 2, and 3. 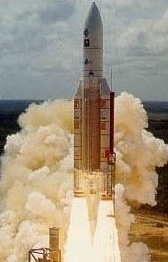 After dormancy since July 11, 1989, ELA-1 launched Vega in 2007. A third ELA launch facility ELA-3, that launches the Ariane 5 series, is also located in French Guyana.